Gonçalo Pinto was the last Portugese player standing. After defeating countryman Márcio Carvalho twice—once at the very start the tournament and then earlier today to knock him out in the semifinals—it fell to Pinto to carry the dream of claiming a Pro Tour trophy for Portugal. In the thirteen years since his Pro Tour debut, Pinto had notched neither a Grand Prix nor a Pro Tour Top 8. Now he was one match away from a win, just like his opponent. 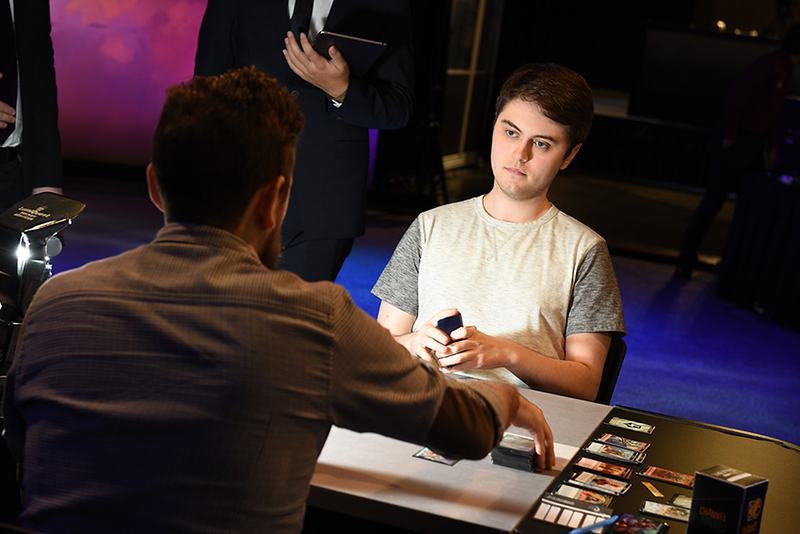 Wyatt Darby had played in his first Pro Tour only a few months ago at Pro Tour Amonkhet in Nashville. Despite a shorter career coming into the tournament, Darby followed a path similar to Pinto's into the finals. By defeating fellow American and Hall of Fame standout Owen Turtenwald in their semifinal match, Darby had just one hurdle left to win a Pro Tour on home turf. Only one player would claim the elite title of Pro Tour Dominaria champion. The beautiful Pro Tour trophy waiting for a new name, but would it be Gonçalo Pinto or Wyatt Darby? Red-Black Aggro and Mono-Red Aggro are sibling decks. They have similar creature cores—Bomat Courier, Soul-Scar Mage, Goblin Chainwhirler, Scrapheap Scrounger, Rekindling Phoenix, Glorybringer, and even Hazoret the Fervent. Abrades are a shared card too. Their plans are similarly straightforward: Deal lethal damage to opponents as quickly as possible, and maybe refill your hand with a Bomat Courier if you can. Where they differed was focus and speed. The Mono-Red Aggro deck could still access black mana to activate Scrapheap Scrounger, but it had Earthshaker Khenra and Lightning Strike. Darby even brought Fight with Fire to forge victory. The deck focused more on pushing damage, and that made it potentially faster. Red-Black Aggro, in Pinto's hands, leaned far more into the black splash than decks like Darby's. Unlicensed Disintegration, Cut // Ribbons, and multiple copies of Doomfall all helped push the deck through longer games with more answers for tricky threats. Exiling a Rekindling Phoenix with Doomfall, or killing a Glorybringer with Cut into causing massive life loss with Ribbons embodied a range of plays Mono-Red Aggro couldn't reach. 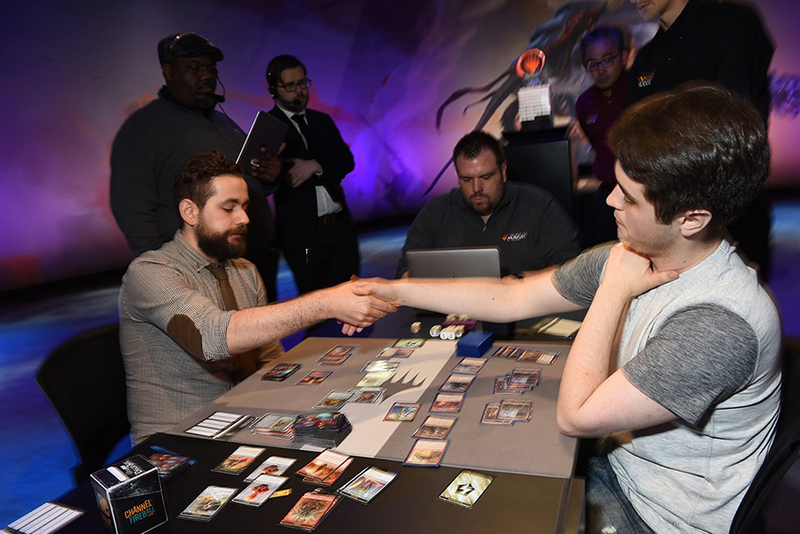 Of course, with Mono-Red Aggro's focus on speed and consistency it didn't need that range in play—and it's why both competitors had found success all the way through to the finals over the weekend. Darby opened the game with Soul-Scar Mage as Pinto was stuck on just one land for a turn—enough for a Bomat Courier that would go to work. A second land found a Heart of Kiran for Pinto, but Darby's faster deck had already sliced Pinto down to 13. Goblin Chainwhirler on curve after Earthshaker Khenra will do that. Missing a third land for a turn, Pinto passed back and Darby continued to attack. Abrade took away the Chainwhirler, but Pinto fell to 10. Lightning Strike from Darby cleared a would-be blocker in Soul-Scar Mage, then Shock and another attack put Pinto to 5. Unrelenting, Rekindling Phoenix put Darby over the top in game one. Wyatt Darby is all business in the final match of the day. Pinto took a mulligan but led a quick start in the second game with Soul-Scar Mage into Kari Zev, Skyship Raider. Darby's Soul-Scar Mage and Abrade to answer was a bit quicker, and Pinto didn't have a three-drop. Darby's Goblin Chainwhirler arrived on turn three, only to meet a Cut from Pinto, but the momentum was all Darby. Earthshaker Khenra and Lightning Strike put Pinto to 12 life without any blockers in sight. Hazoret the Fervent arrived, emptying Darby's hand, and Pinto was suddenly at 4 life—then defeated—all in the span of three minutes. Speed and consistency is where Mono-Red Aggro shines. Darby was up to quick 2-0 lead on Pinto. Would sideboards change the story? After switching things up with their sideboards, Pinto got to lead off with Scrapheap Scrounger into Darby's Lightning Strike. Goblin Chainwhirler followed for Pinto, and Abrade was the answer from Darby. Soul-Scar Mage was Darby's first creature, but a returned Scrounger with Pia Nalaar put Pinto into the attack position. Pinto threatened with Heart of Kiran, but a timely Lightning Strike (aided by that Soul-Scar Mage) shrunk it to irrelevance. But Darby was still far behind. Goblin Chainwhirler cleared away Earthshaker Khenra and Pinto put Darby to 12. Another removal spell for Chainwhirler let Darby untap into Rekindling Phoenix—which led to Abrade into Shock from Pinto—and Darby fell to 5 life on the next attack. Another Phoenix wasn't enough for Darby as Pinto pushed the last points through on his next attack. Matching Soul-Scar Mages started the fourth game, but Darby's Earthshaker Khenra let him attack through first. Scrapheap Scrounger joined the fray for Pinto, but Aethersphere Harvester helped Darby keep the pressure on. Pinto was already at 14 life. Goblin Chainwhirler gave Pinto the edge on the ground, but Rekindling Phoenix for Darby let him attack with his Harvester—and put Pinto to 10 life. Undaunted, Pinto attacked with his Whirler, Scrounger, and Mage. Darby fell to 9 life himself. Earthshaker Khenra set aside Pinto's lone blocker—another Soul-Scar Mage—then Kari Zev appeared to crew the Harvester. Abrade let Pinto take only 4 from the Phoenix, and when Pinto untapped he cast Abrade and Shock to clear a path for 9 more damage back and the win. Gonçalo Pinto casts one of many removal spells en route to a game four win. Pinto won back-to-back games in a hurry, setting the stage for the last game of the tournament. Unsurprisingly, Darby chose to go first for that fifth game. Unfortunately, he had to take a mulligan before starting—but it soon wouldn't matter. Pinto's leading Soul-Scar Mage hit a Lightning Strike, and Darby got on the board with Goblin Chainwhirler. Aethersphere Harvester, with a Scrapheap Scrounger to crew it, kept the Chainwhirler at bay so Darby set up with Rekindling Phoenix instead. Pinto bought himself some time—and put himself up to 22 life—with the next attack. Pia Nalaar clogged the battlefield on Pinto's side. The Phoenix dealt 4 in the air, but Pinto kept the pressure on with Aethersphere Harvester. At 21 life to Darby's 13, Pinto looked in total control. Kari Zev, Skyship Raider and a pass was all Darby could muster. This time, he traded Phoenixes with Pinto, and a Chainwhirler post-combat took out the Elemental left behind, ensuring Darby wouldn't get his Phoenix back. Chandra's Defeat did the same for Pinto, but a follow-up Hazoret the Fervent for Darby meant it was his turn to get back into the game. Going to 4 life, Darby needed to swing 16 damage in a hurry as the army on the ground for Pinto was four deep—two Scrapheap Scroungers, Goblin Chainwhirler, and Pia Nalaar. But Hazoret attacked alone again, putting Pinto—who refused to block—to 11. What happened next is exactly why these battles are any player's game. Pinto sent in the would-be lethal attack: Aethersphere Harvester and a Thopter token. Abrade destroyed the Harvester, but Pinto had only enough mana to pump up the Thopter via Pia Nalaar twice, dealing deal 3 damage but not 4. Darby stood, battered and bruised, at 1 life. But 1 life is not 0. Darby drew for his turn, and Glorybringer appeared from the top of the library. Darby cast it and quickly moved to attack—a lethal attack thanks to Glorybringer exerting to clear away one of Pinto's blockers. 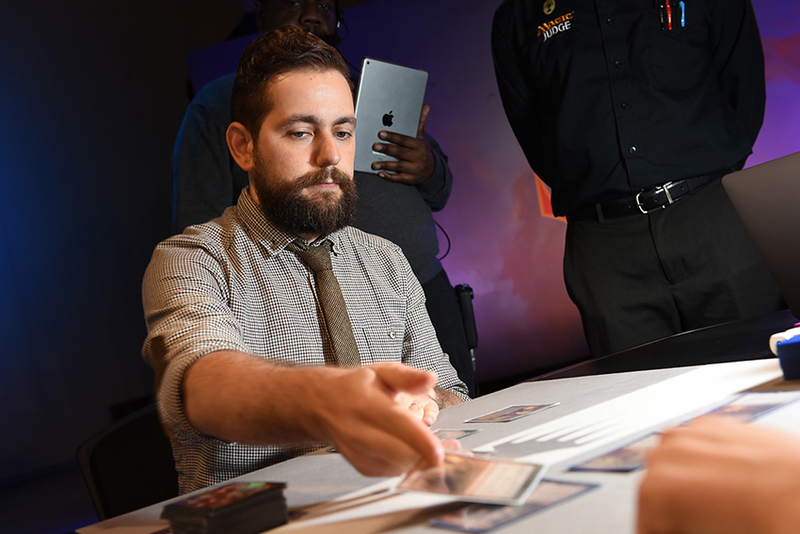 Without a way to stop the damage, Darby edged Pinto out in the last possible turn of the damage race with the only card in his deck that could do it. 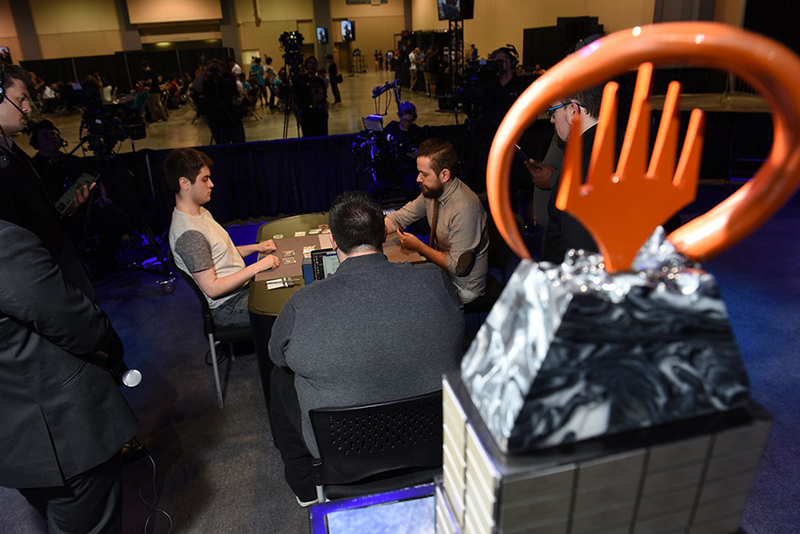 Pinto extended his hand, and a new Pro Tour champion was forged from the fires. Wyatt Darby (right) seals the deal over Gonçalo Pinto (left) and emerges as champion. Wyatt Darby defeated Gonçalo Pinto, three games to two, to become champion of Pro Tour Dominaria.